Picture this: it’s been a long day, and you’re ready to come home to a relaxing evening with your family. As you pull into your neighborhood, it quickly becomes apparent which houses are making an impression, and which homes are simply stuck in the dark. You start to notice that certain homes have that warm, safe, inviting feeling as you pass, each one sharing a particular feature most homeowners overlook. I’m speaking, of course, about the beauty, security and safety of landscape lighting. Your home isn’t just a place to lay your head. It’s a castle that protects your family, a beacon that welcomes your neighbors, and a venue to host and enjoy your accomplishments at all times of the day. 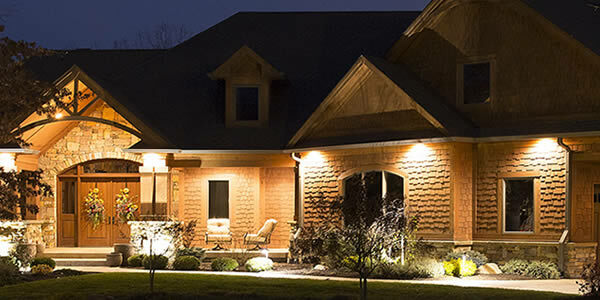 By utilizing the right landscape lighting, your home will be transformed into a brighter, safer and more aesthetically-pleasing place for you and your family to enjoy. Remember, it isn’t just what’s inside that counts when it comes to your home. You’ve worked hard to add beauty and design to your walkways, backyards, patios and porches, so why only view it when the sun is out? Landscape lighting can add a dramatic effect by highlighting the subtle textures, colors and shapes around your house or even highlight plant material or special garden art. 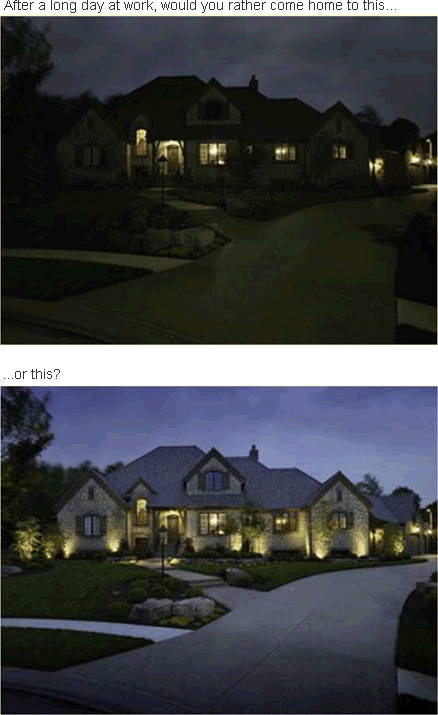 As you can see, the difference is quite remarkable when you brighten up your property with the proper lighting. 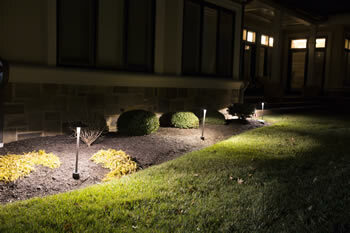 In addition to adding beauty, landscape lighting adds much more value to your home and outdoors. Let’s face it – when the sun goes down the backyard loses its functionality and usability if it is covered in darkness. By adding the proper lighting, you will now have the perfect venue for dining, grilling out and hosting guests in the great outdoors! At Primary Grounds, our design team will work with you to create a custom lighting plan perfect for your needs. Lighting system examples include path lighting along your patios, uplighting along your trees and bushes, accent lighting around your pergolas and outdoor fixtures, and aquatic lights to add a new dimension to your water features and pools. Primary Grounds knows that your home is a place to live, relax and enjoy your family in comfort and safety. Professionally designed landscape lighting is a great way to insure that you and your guests are given that extra bit of safety and security. For example, by adding path lights along your sidewalks and steps will greatly reduce the risk of tripping and will help guide people along the right path to walk. Proper landscape lighting can also extend the evening and allow for families, friends and guests to enjoy more outdoor activities during the summer. 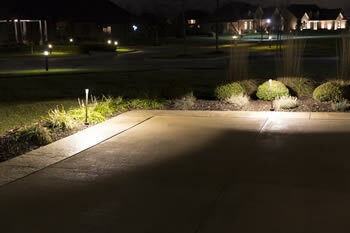 Most importantly, proper lighting may even reduce your risk of becoming the victim of home invasion. Studies have shown that 23% of all burglars gain entry into the home through a first-floor window. Dark bushes, trees and pitch black yards also create a perfect hiding place for prowlers. Landscape lighting works twofold to both illuminate these potential hiding spots while also making the home appear occupied. Installing lighting timers and sensors also help to maintain the effect even while you’re away. Primary Grounds knows that quality ma􀆩ers when it comes to your home. Let our design/build team work with you by utilizing both industry standard products and exceptional craftsmanship to ensure that your lighting needs stand up to both time and Indiana’s infamously temperamental weather. We’ll work hard to design a lighting system that meets your needs and highlights (literally) the beauty and aesthetics of your home. We use all LED, energy efficient systems so the impact on your electrical use is minimal. By using an LED system, you can have your lighting plan installed in phases if you prefer, or you can always add a fixture if needed as landscaping changes.